The story begins as they always do, with a call. 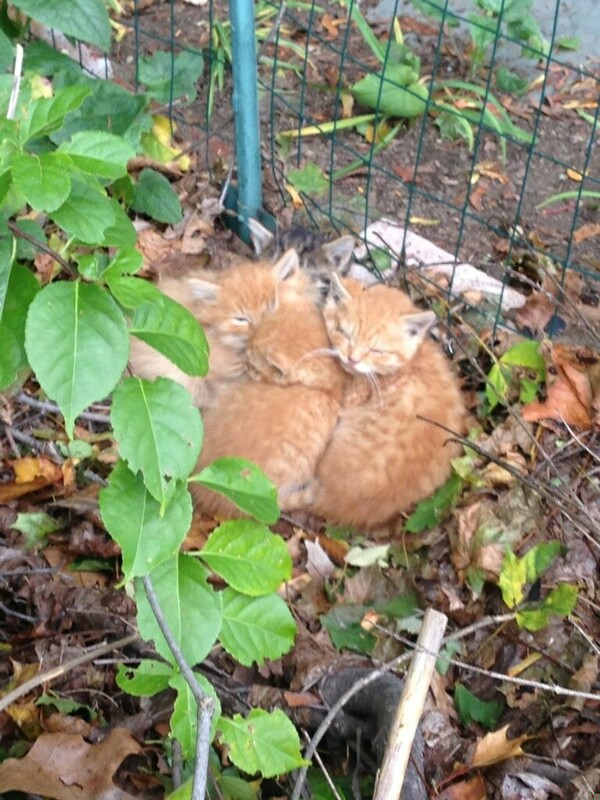 My friend Shawn called about 4 kittens in his brother-in-law, Mike's yard. 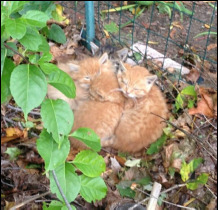 They hadn't seen a mother cat and the babies were huddled in a pile outside in very cold weather, the wind was blowing so hard I almost couldn't stay outside myself. He said their eyes were infected and some were glued shut with puss. The picture he sent of them huddled out in the open was so sad. I called Paula, who lives on the area and volunteers for our group, and asked her to go and see what was going on. When she arrived she was heartbroken to see such tiny babies in such terrible condition. She was able to grab two of them but the other two ran off. 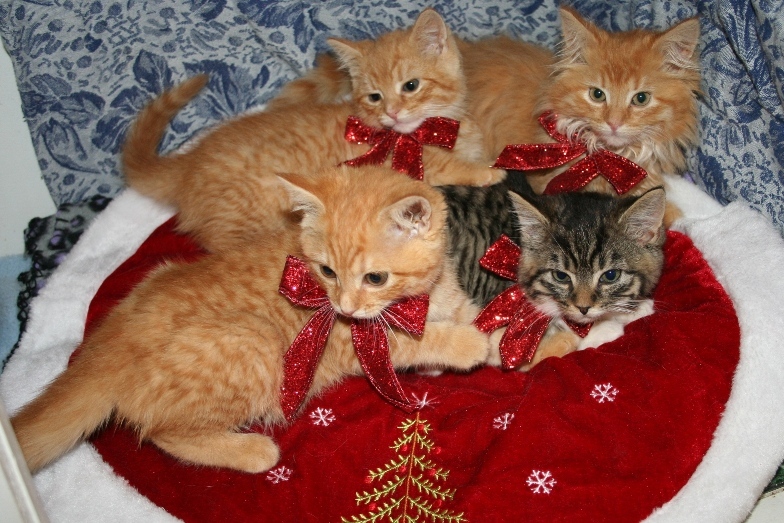 Mike said he had seen them living in a compost pile behind a shed under a dead Christmas tree a few days ago. Paula looked under the dead tree for the remaining two, it was dirty wet and not a spot you would expect to find anything living. Paula did not see any sign of them. She was feeling defeated and worried they wouldn't be found in time. They were not going to last long in these conditions especially being sick. 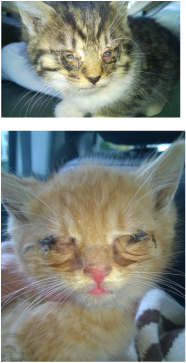 One of the kittens that had run off had both eyes glued shut with infection and puss so was not able to see at all. She called me for help and I arrived an hour later. The condition of the first two was not good. 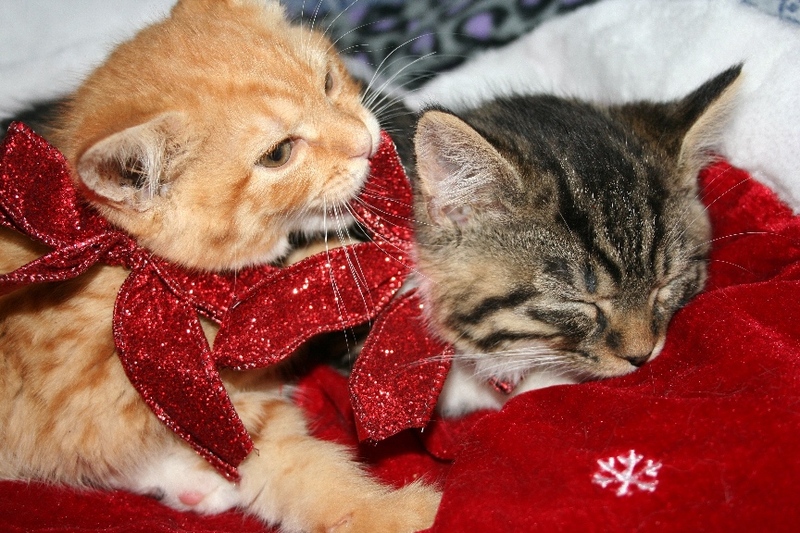 They were skin and bones and very sick with upper respiratory infection. We gave them food, they ate like crazy and we went back out to find the other two. They were not going to survive of we didn't find them. When we went back to the yard we spotted one of the kittens, but it spotted us too and once again darted away. I was sure it went back into the compost pile behind the shed.We looked again and no sign of him. I just knew they had to be in there but we picked up the dead Christmas tree and went through the debris and saw nothing. We were not about to give up. I remembered that a friend told me they had luck getting kittens by playing an audio clip of a momma cat calling her babies. So we thought we would try it, what did we have to lose? We played the momma cat audio on Paula's phone and like magic the one little orange kitten came from behind the shed with a look on his face as if he was so excited that his mom was back and in that moment he saw us instead, his face changed to fear and once again he was off and running. It broke my heart to have disappointed him, I wished I could have given him back his momma. This time I was absolutely sure he went under the dead Christmas tree and for the 5th time we picked it up and looked....nothing! Amazing. 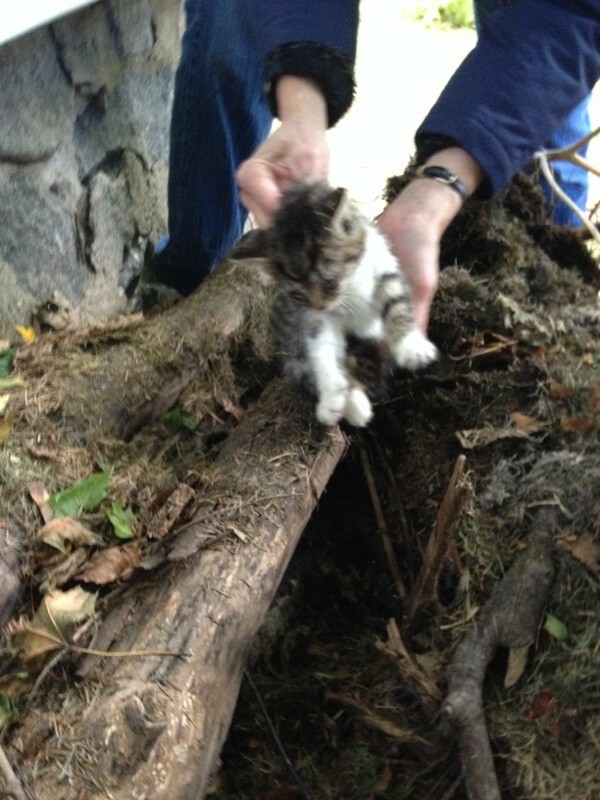 So I had Paula play the momma cat again as I watched the compost pile, and as she played it I watched the little kitten emerge very slowly out of a hole from under the tree that I never would have known was there and I grabbed him!....now there was still one more. This time even though I could not see him I knew the last kitten, a tabby, was in the hole. I reached in and I could feel him buried in the wet cold ground. 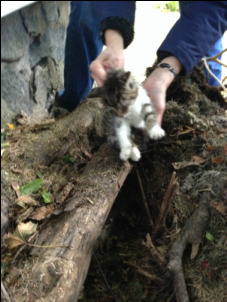 As I began to pull him out several large black spiders crawled out of the same hole and were on my hand and arm......it took all of my focus not to freak out and let the kitten go....paula kept saying....don't let go, don't let him go.......I won't. And I didn't. 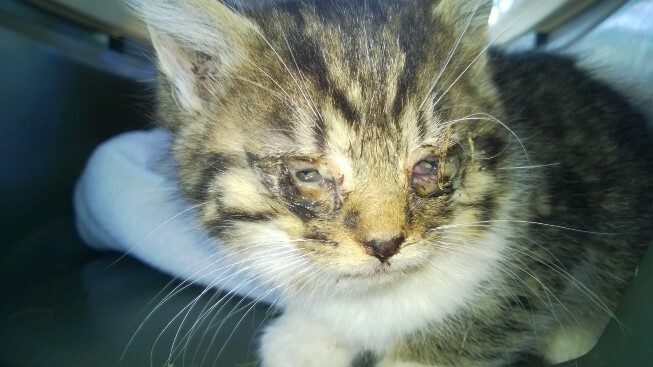 Once we had them all safely in a carrier we started to clean their eyes and give them food. The tabby boys eyes were glued shut he must have been terrified in that hole, not being able to see to get away, he was lucky a fox didn't find him first. 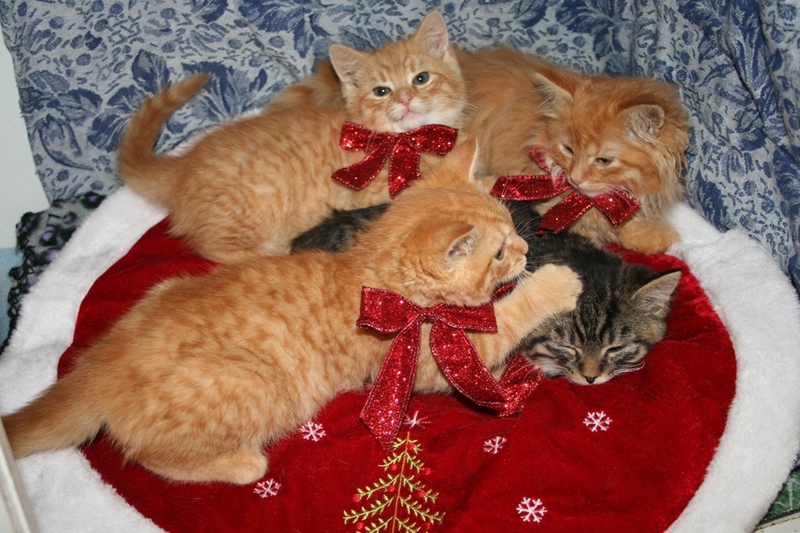 All of the babies were covered in fleas, ticks and had ear mites. Their skinny bellies full of worms, they were literally being eaten alive from the inside and outside and sick on top of all that. I honestly think they were on their last day, it got very cold that night and with no mom to protect them and no food they would have perished. Once in our care they got eye medication, antibiotics and food. We de-flead them and over the next week killed the worms and ear mites. They were getting healthier and more beautiful everyday. Now they are a little shy but healthy and playful and loving life. 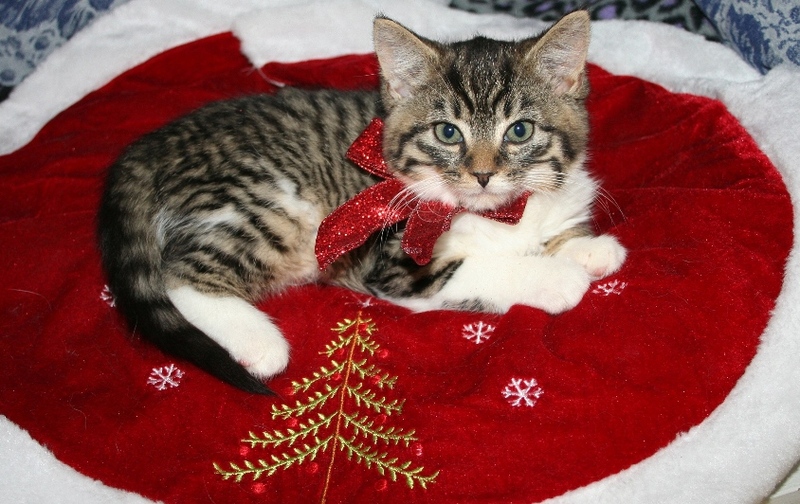 They are ready for new homes just in time for Christmas where they can sit under a green Christmas tree in a warm and loving home. See the video below for some "tub ball fun"